Why a section solely on impacted canines? – Because canines have a specific and unique role in the mouth and dentition and they are often affected by severe eruption problems. – Because their behavior is hard to predict; they behave sometimes like a “jack-in-the-box”; we never know when and how they will come out! Function: Canines have a particular functional role; they guide the mandible when it moves, which protects the other teeth by preventing them from being in contact with each other. If they are malpositioned in the dental arches, other teeth will have to play the role of the canines and this may cause short or long-term problems (wear, jaw joints problems, etc.). The canine is one of the most solid tooth in the mouth and it can bear significant forces. Its root is one of the longest among all the teeth, including molars. NORMAL OCCLUSION: when they are in function, the canines are the only teeth to touch when the mandible moves (A and C) to the right and (B and D) to the left. No other teeth, anterior or posterior, must ideally touch during side movements (C and D = front view). Esthetics: Canines have a significant esthetic role. They are in the “corner” of the mouth and they have a particular shape that ensures the transition between the anterior and posterior teeth. They are neither thin like incisors nor wide and square like premolars and molars. Eruption: Canines are the last anterior teeth to erupt in the mouth (mostly the upper ones). Thus, they must “adapt” to the space remaining in the dental arch, which is often insufficient for them to get into a normal position. The permanent canine is a lot wider than the temporary tooth it replaces, which necessitates additional space. Because of their size, slower development, sequence of eruption, longer eruption path to follow and the available space that is often insufficient, canines must attempt to “sneak in” between the other teeth that have already erupted to arrive at their destination in the dental arch. One can hope that erupting canines can move the other teeth in order to make their way and reach their goal, but this will not occur. Teeth that have already erupted are well installed and will not move significantly to “welcome” the canines. Canines must thus change their eruption path and head outward (on the cheek side) or inward on the palate side (ectopic eruption). Sometimes, they simply can stay stuck in the jaw bone. We then say that they are “impacted“. After the third molars (wisdom teeth), upper canines are the teeth that are the most frequently impacted. 1 to 2% of the population is affected by impacted canines. They are more often impacted than the lower ones and palatal impactions (on the palate side) are more frequent (85%) than those that erupt outward (15%). Although impacted canines can be present on both sides of the mouth, they usually affect only one side. Most impacted canines affect only one side of the mouth, but in 10% of the cases, both sides will be affected. When a canine is impacted, there are very good chances that other dental anomalies are present in the mouth as well. The incidence of palatally impacted canines is twice more frequent in women than in men. There is a family trend to having impacted canines (genetics, heredity). Esthetics: If a canine does not erupt, there will either be a smaller temporary tooth (baby tooth – which can shed one day) or a significant space. Function: Without canines that are well positioned in the arch, function will be affected and may cause premature wear of the other teeth. Pathologies: Any impacted tooth may develop pathologies or lesions that can cause damage to nearby structures (cysts, tumors, wear, resorption of the roots of adjacent teeth, dental movements, etc.). In the following example, the occlusion of a 27-year-old young man is relatively acceptable esthetically. A small space is present between the upper central incisors and the midlines are deviated. However, the upper deciduous (temporary) canines are still in place (yellow and blue *) and are starting to be quite worn out. Radiographs reveal severely impacted permanent canines (red *) and the beginning of wear or resorption of several roots on the teeth near the canines (blue arrows). Such a condition did not develop in a few months and could have been detected more than 15 years earlier using X-rays. The presence of temporary canines that remain in the mouth after all the other permanent teeth have erupted should be a sign and a warning that the eruption of the permanent canines is abnormal and should be evaluated immediately. 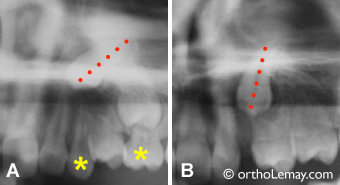 (A, B and E) X-rays showing the severely impacted permanent upper canines (red *) and wear of the root of several teeth (arrows). The temporary canines are still in the mouth at 27 years of age, which is abnormal. If the canine does not come out, a surgical intervention will be necessary to help it erupt. Palatally impacted upper canines (indicated by the arrows). The temporary canines are still in the mouth. Radiograph and picture showing the position of the canines in the palate (indicated by the arrows). (A) This malocclusion, that seems harmless and looks like many others, however hides a serious problem in a 12-year-old young girl; the impacted upper canines have completely worn out the roots of the permanent lateral incisors in such a way that these teeth cannot be saved and will have to be extracted. (B) X-rays show the extent of the resorption of the roots of the lateral incisors (red arrows). The crowns of the lateral incisors are indicated by blue asterisks (*) whereas the permanent canines, having caused the resorption, are indicated by a red asterisk. At 12 years of age, the lateral incisors have erupted since barely 4 years and they are already sentenced to extraction. Upper canines normally erupt toward the dental age of 11 years old, but it is indicated to investigate their position and eruption path by with radiographs one to two years earlier. Incidence: there is a clear family trend (heredity); if a family member has an impacted canine, 40 % of the members of his/her family had some as well (Todd, 2008). Guidance: the upper canine needs the lateral incisor during its normal eruption process. It uses the root of this tooth as a “guide” to make its way to its final destination in the arch. If the lateral incisor is absent, misshapen, badly positioned, or is abnormally affected by resorption (root), it can affect the eruption of the canines and cause an ectopic eruption. If the primary canine does not resorb normally, it will cause a mechanical obstruction that may affect or prevent the eruption of the permanent canine. During normal eruption, canines go down following the roots of the lateral incisors and will bring the incisors closer together by moving them mesially. Thus, they can close a diastema (space) between the central incisors (see illustration on the opposite side). Most of the time, an ectopic canine (this also applies to other teeth) is a sign of a significant lack of space in the affected dental arch. During the eruption process, the permanent canines must resorb (wear down) the roots of their temporary predecessors. Palatally impacted canines do not resorb the roots of the temporary canines, so these teeth can stay in place and be “solid” for a very long time, until adulthood. When the patient described above (21-year-old young woman) started her orthodontic treatment, the temporary canines were extracted. Their root only showed very little resorption (indicated by arrows on the picture). When a developing canine is significantly malpositioned, it can cause the same kind of damage to the permanent lateral incisors, which is not desirable, unlike the temporary canines, and may compromise the survival of the affected teeth. We use this expression to describe the phenomenon where people only see one aspect (esthetics) of the problem, that is only one misaligned tooth (canine) that they find unesthetic. 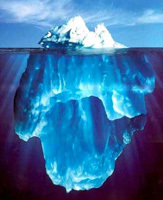 In reality, the (invisible) cause is much more important, like the iceberg that only shows one peak at the surface of the water, while hiding an enormous mass underneath the surface. People would like it very much to align “only one crooked tooth”, but very often, this is impossible because the problem in its entirety must be considered. An ectopic canine often indicates an underlying space problem that is much more important than what can be seen at first sight. The panoramic radiograph allows the evaluation of what is not always visible in the mouth. The upper canines are much tilted forward and do not have enough space. Loss of space and eruption problems in an 11-year-old boy. The upper and lower canines are already completely blocked by the premolars that try to come out. Examples of ectopic canines. One or several canines may be affected. They can erupt outward or inward on the palate side. ➡ To see other examples of ectopic canines. 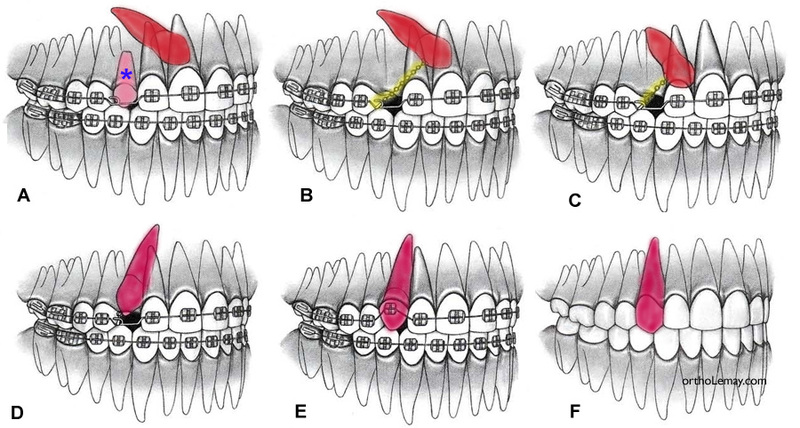 The treatment of impacted canines necessitates the creation of space in the dental arch (extraction, orthodontic displacement of other teeth), to expose the impacted tooth in order to bond an attachment to it and apply an orthodontic traction using a light force to make the tooth “come down” into place and position it in the dental arch. The following diagrams illustrate these different steps. The more an impacted canine is horizontally positioned and the more it is behind the lateral incisor, the harder it will be to correct it. The success rate decreases with the patient’s age, so an early intervention is important. Traction of an impacted canine may necessitate a few months to more than one year depending on its position, the mechanics used and… the patient’s cooperation. Palatally impacted upper canines in a 13-year-old girl. Extraction of temporary canines and orthodontic traction. See legend below for details. (A) An X-ray of the palate shows the abnormal position of the canines (blue *). The temporary canines are still in place (red *) and probably contributed to the impaction of the canines during their development. (B) The mucous membrane of the palate shows small lumps that give away the presence of canines on the palate side. This is a good indication of the position of the canines even before taking radiographs. (C) The panoramic X-ray shows how much both canines are tilted mesially as well and are behind the roots of the lateral incisors. (D) The temporary canines were extracted. Brackets were installed to align the teeth and provide the space necessary to accommodate the canine. Traction attachments and ligatures were bonded to the impacted canines. Traction is initiated and the canines are starting to straighten as they head down toward the dental arch. (E) In the mouth, all that is visible is a ring of the little chains (arrows) which a flexible wire goes through and which applies a light traction force. As the canine comes down, the ligature comes out of the gingiva and will progressively be shortened (cut) until the canine erupts completely through the mucosa. At this moment, a regular attachment (bracket) will be bonded to complete the positioning of the canines. Making the impacted canines reach their final position can take from a few months to more than one year. A question that is frequently asked is about how visible the attachments and traction ligatures are during the treatment. They are just barely visible. Most of the ligature is buried into the soft tissues of the palate in order to attach to a “button” that is bonded to the tooth that is not visible. As the canine comes down, the little chain extends outside the gingiva and it is progressively cut until the tooth appears. At this moment, a regular attachment (bracket) is placed on the tooth. These examples show that the traction process only shows a very few items of the appliances. In certain cases, it is even possible to hide the traction ligature and the space using a prosthetic tooth fixed to the orthodontic appliances. (A) It is possible to appreciate, with the X-ray, the length of the traction ligature buried in the mucous membrane of the palate. (B) A small part of the little chain comes out of the gum to attach to the archwire. (C and D) Artificial teeth fixed on the brackets bonded to the wire hide the space where the canines will be, as well as the little chain. (A) At the beginning of traction, the loops of the little chain are visible outside the gum. (B and C) Once the canine has almost reached the surface, the little chain is cut and a wire or another traction mode may be engaged directly in the attachment bonded to the surface of the canine. (D and E) Despite the fact that the little chain is quite long (visible on an X-ray), what appears in the mouth is very negligible and practically invisible. Is traction of an impacted canine “guaranteed”? NO. 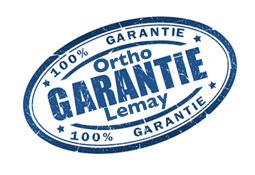 As for any dental or orthodontic procedure, the orthodontist cannot promise or “guarantee” any result during the traction of an impacted or ectopic canine. He can only ensure that all means are taken and all proven and known techniques are used to reach the treatment objectives that he defined with the patient and/or his/her parents. An impacted canine is a particular challenge in orthodontics and several factors will influence the success of treatment, such as the severity of the impaction, the patient’s age, his/her cooperation during the treatment, etc. The following examples (cases 1 to 3) show similar conditions and possible long-term consequences of an impacted canine. Case 1: This 15-year-old young girl would have a very acceptable occlusion if her upper right canine was not palatally impacted. (A) The occlusion is generally excellent, but we notice the presence of a temporary upper right canine (*). (B) The X-ray reveals the presence of the impacted canine which is very badly positioned (red arrow). This problem could have been avoided or minimized. The blue arrow indicates the canine on the opposite side that erupted normally. This problem was surely visible on a panoramic X-ray starting at 8-9 years of age and could have been avoided or at least minimized with adequate supervision during the eruption of teeth and dental development. The temporary canine would have needed to be extracted several years ago to create space and guide the permanent canine toward the dental arch. Keeping the temporary tooth that long contributed to guiding the permanent canine toward the palate. It is to be noted that the temporary canine was already problematic since a root canal treatment was performed on this tooth (white area visible in the root of the tooth on the X-ray). The dentist performed this procedure to preserve the temporary tooth when it would have been preferable to simply extract it in an attempt to try to influence the eruption of the permanent canine. In comparison, the canine on the opposite side (blue arrow) erupted normally. Even though only one tooth is mainly affected, the intervention to expose and lodge the impacted canine in the dental arch is complex, long and costly for this patient. Good supervision would have been simpler and would have probably reduced the necessity for orthodontic corrections during adolescence. Could this situation and the following ones have been avoided? To know more on prediction and interception of impacted canines. Case 2: This other example could demonstrate what could have happen to the previous case if it had been left without supervision for several years. 26-year-old woman with a good occlusion except for an impacted canine that caused damages to the bone and to an adjacent tooth. See explanations below. (A) A 26-year-old woman with a similar condition to case 1 above; she shows an upper right canine completely formed, but severely impacted on the palate side (3). This condition, that has been progressing for at least 15 years, could have possibly been avoided with adequate supervision during the eruption of the teeth (using radiographs and serial extractions (extractions of deciduous teeth)). With time, the temporary canines shed when the impacted permanent canine progressively worn out its root. This results in a significant and unesthetic space where the temporary canine was (yellow *). (B) The impacted canine has resorbed (worn out) more than 40% of the root of the upper right permanent lateral incisor. The red arrow and line indicate the tip of the worn out root. The long-term health and survival of this lateral incisor are now uncertain. A very significant bone defect (bone loss visible in dark on the X-ray) has developed near the right canine (red *) in a way that attempting to lodge the canine in the arch may necessitate a surgery to add bone or be doomed to failure. In comparison, the left canine has come down normally by itself (blue arrow). To know more on prediction and interception of impacted canines. Case 3: The longer the situation lingers, the more chances wear will occur! (A) Palatally impacted upper right canine. (B) Radiograph showing the impacted canine. (C) Function of the jaw on the right side; wear of the lateral incisors. (D) Excessive overbite. (A and B) Like the previous cases, this 34-year-old woman has a palatally impacted canine. Despite a significant space, it is not sufficient to allow the canine to come down in the dental arch by itself. Functionally, when the mandible moves to the right, the lateral incisors touch instead of the canines. This causes premature wear of the lateral incisors (the degree may vary from one person to another depending on the force used during jaw function). To know more on prediction and interception of impacted canines and on tooth wear. Using an X-ray, a perceptive dentist wanted to verify why the upper lateral incisors were tilted. We discover the presence of a pathology (cyst) around the crowns of the impacted canines (arrows). 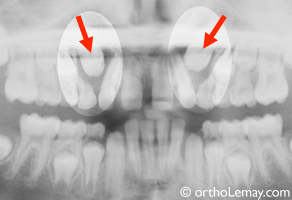 These cysts cause bone destruction (dark zone) that may affect the lateral incisors. It is indicated to extract temporary teeth (selective extractions) in an attempt to redirect the canines and eliminate the pathology. Such an intervention minimizes the chances of seeing the canines become palatally impacted later. Cyst and bone destruction around the crowns of the impacted upper canines. One of the best ways to influence the eruption of permanent canines that do not find their way normally is to perform serial extractions. This consists of selectively extracting temporary teeth to make space for the replacement permanent teeth that try to erupt and come out. The example on the right how the extraction of two temporary teeth (*) allowed a canine (dotted red line) to straighten up and head toward where it must erupt in the dental arch. Even if this intervention improves the eruption of the canine, a lot of space is still missing to allow the normal eruption of this tooth and orthodontic corrections will still be necessary later to regularize the situation and obtain a normal occlusion.To know more on serial extractions. (A) Canine tilted toward the lateral incisor (dotted line). The temporary teeth (*) will be extracted. (B) A little more than one year after the extractions, the eruption path of the permanent canine significantly improved. When canines are not well positioned, they cannot play their role of “natural guide” during the function and movements of the mandible. Other teeth, most often anterior ones, then take over and this may lead to excessive and premature tooth wear. The case below is a “typical” example of this phenomenon; a 14-year-old girl whose lateral incisors have already started to wear down. Example of “functional” wear in a 14-year-old girl; (A) The upper canines are high and cannot play their protective role during jaw movements. (B) When the mandible moves to the right (above pictures) or to the left, the lateral teeth touch and start to wear down. (C) At the end of the movement, wear is visible on the tip of the lateral incisors which have already shortened. This 24-year-old young man shows a situation where we can compare the functional role of the canine on both opposite sides. (A) The upper right canine (blue arrow) touches the opposite canine and is in function during the mandibular movements to the right. It already starts to show signs of wear; the tip is flat. On the opposite side, the canine does not have enough space and is outside the arch (yellow arrow) and consequently, is not functional, does not show any signs of wear and the tip is still very pointy just like when this tooth erupted. (B) When he opens his mouth, we can better appreciate the difference between the tip of both canines and notice that the right canines already show significant wear for a young adult (circle). The left canines being less functional, the incisors must therefore guide the jaw and this contributes to wearing down their incisal edges. Up to what age can an impacted canine be treated? Theoretically, there is no age limit to attempt to expose and bring a canine into the mouth, but in practice, if a canine stays impacted for a long time, the prognostic to successfully move it using traction tends to worsen. With years, there are more chances that an impacted canine becomes ankylosed (fused to the bone) and cannot be moved, that it affects the roots of the adjacent teeth (wear, resorption) and shows other problems. The use of new 3D imaging techniques greatly facilitates the location of impacted teeth and the detection of damages that they can cause to surrounding structures. Despite the increased risks of complications associated with the treatment of impacted canines in adults, it is often worth it to put in the effort to attempt to position these teeth correctly in the dental arches. The following examples show cases of adults in whom we treated impacted canines. (A, C, D) The upper left canine of this 46-year-old man is palatally impacted. The temporary canine is still in place (arrow and blue *). (B, E, F) The orthodontic treatment allowed the permanent canine to be put into place (arrow and red *). It shows a darker color because it has never undergone whitening or another surface treatment like the other teeth which have been in the mouth for more than 30 years. Extractions do not correct anything! Often, patients or their parents ask the dentist or the orthodontic if it is possible to extract a tooth to “make room for the other teeth”. This is particularly common in the case of canines that erupt outside the arch because, as described previously, these teeth are the last ones to erupt and they are often in an unesthetic position. 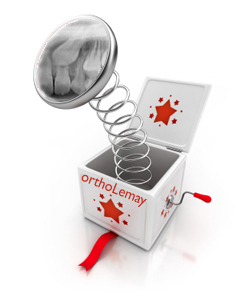 One thing is for sure, we prefer avoiding the extraction of a canine… almost at any cost! (A and B) This 19-year-old young woman had one of her lower left premolars extracted (where indicated by the blue arrows) to help the eruption of the canine. Even though this facilitated the eruption of the canine, the effect was disastrous on the alignment of teeth that shifted to the left (red arrows), causing a significant asymmetry of the midlines (blue lines = middle of each dental arch). 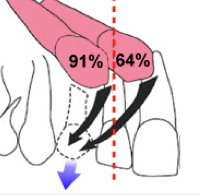 (C) A line going through both lower canines shows the significant asymmetry that developed following the migration of teeth in the space created by the extraction of the premolar. When such an extraction is envisioned, it is still indicated to preserve the space using orthodontic appliances to guide the eruption of the teeth and prevent undesirable dental movements that will cause other problems. Other examples where a malocclusion remains and even got worse following extractions that were supposedly performed to “help” or improve these malocclusions. Extraction of 3 premolars (indicated by the arrows), deviation of the midlines and uncontrolled migration of teeth. There is as much dental crowding and occlusal problems despite the extraction of 3 teeth that “was made to fix the problem”. The upper left canine (*) is still as crooked and has not enough space despite these extractions! The blue arrows indicate where the 3 premolars were extracted. The blue lines indicate the midlines (middle of the arches). The red arrows indicate the direction where the migration of the midlines occurred and where the migration of the upper left canine (*), that moved on top of the lateral incisor, occurred. 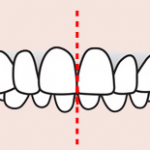 The red line (D) indicates the resulting asymmetry in the lower arch; there are 2 premolars on the left and only one on the right. Severe malocclusion (anterior and posterior open bite, maxillary constriction, dental crowding, asymmetry). An upper left premolar was extracted at an early age (blue arrows), the upper teeth shifted to this side, worsening the asymmetry of the midline (A and B-yellow arrows and red line), without improving the severity of the malocclusion, esthetics or function at all. This case still requires a major orthodontic intervention, but on top of that, the orthodontist must deal with a more severe asymmetry. Extraction of an upper right premolar (arrow) having created a significant asymmetry in the maxillary arch. Significant asymmetry caused by the extraction of premolars without subsequent supervision. (A and B) The extraction of an upper and lower premolars on the right side (arrow) caused the movement of anterior teeth to the right. The dotted line shows how significant the shift is. (C) The mandible and the chin also shifted to the right. The yellow line is aligned with the upper central incisors shifted to the right. (D) The deviation of teeth affects the smile esthetics. (E) The arrows indicate where the teeth were extracted. ➡ To know more on midlines and asymmetries of the dental arches. This case shows well the crucial role of the canines that must guide the jaw and protect teeth when it is in function. Both permanent upper canines of this 21-year-old young man are palatally impacted. The temporary canines (arrows) are completely worn down and cannot guide the mandible properly during function. This role then comes back to the incisors which also show signs of wear (circle). He has been functioning like that since approximately since the age of 10. What will happen in 20, 30 or 50 years if he stays like that? To know more on tooth wear. Tooth wear of incisors caused by the absence of canines to guide the mandible when it is in function. It is normal to see a diastema or an interdental space between one or several anterior upper teeth during a certain stage of dental development and the eruption of teeth. If the upper canines are well positioned and have enough space, their eruption path will allow them to migrate down along the roots of the lateral incisors and move or “push” the incisors toward the middle of the dental arch, thus allowing the closing of the central diastema (see example below). However, in “modern” dentition, eruption problems and significant lacks of space are frequent and can prevent this “ideal” situation to occur naturally. We often blame the presence of a muscular attachment called “labial frenum” between the incisors for being responsible for the space between the teeth and several specialists recommend cutting or excising this frenum (a procedure called a frenectomy) at an early age, hoping that the diastema closes by itself. This is contraindicated as long as the canines have not erupted. To know more on “the controversy” about labial frenectomies. Example of a normal diastema closure between the upper central incisors following the eruption of permanent canines. (A) At 8.9 years of age, this boy shows a significant diastema and a labial frenum that attaches between the central incisors. (B) Almost 5 years later (13.5 years of age), the permanent canines have erupted and contributed to closing the diastema by moving the incisors mesially. No frenectomy was performed. This section is under construction, but you will find more information about it in an answer to a question in French.